These are the guidelines to root Samsung Galaxy Core Prime SM-G360T smartphones running on the Android 5.1.1 Lollipop software update. The following tutorial uses the CF-Auto-Root tool by Chainfire and the Odin flash tool made by Samsung’s developers. You can use the Odin flash tool for flashing official firmware files and updating your device manually. It’s also a handy tool for anyone who is wishing to root or install a custom recovery on a Samsung smartphone. You must have the Samsung Galaxy Core Prime with the SM-G360T model number to use this guide. You can find out what your model number is by tapping on the Menu > Settings > About Device > Model Number. You are using a version of the CF-Auto-Root tool in this guide that is based on LMY47X.G360TUVU1AOF9 firmware. You do not need to be running that same LMY47X.G360TUVU1AOF9 firmware on your Samsung Galaxy Core Prime smartphone to use this guide. The firmware build ID is supplied by Chainfire so you can use it as an indicator if you like. Chainfire says some Samsung devices will refuse to boot old images. Download the Samsung USB Drivers  from the dotTech USB Driver downloads page and install them on your computer running Windows for the Samsung Galaxy Core Prime device to be able to talk with the Odin flashing tool. Download the CF-Auto-Root package for the Core Prime G360T on Android 5.1.1 from this link . Open the folder where your downloaded ended up and drag the CF-Auto-Root zip file over to the desktop. Extract the file to the desktop by right-clicking > extract here. You will see the Odin flashing tool and the rooting exploit for the Core Prime smartphone on the desktop after the extraction is complete. Double-click and run the Odin app on the computer so it opens and is running. 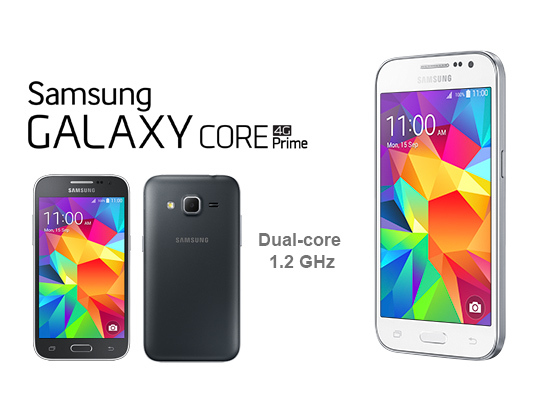 Boot the Samsung Galaxy Core Prime in download mode by pressing the hardware key combination required. Connect the Samsung Galaxy Core prime smartphone to the computer with the USB cable. Wait for at least a few seconds for the USB Drivers to pick up your Core Prime device and then look at the Odin user-interface for an “added” message. No message usually means the drivers are not working. Click the PDA button or the AP button from the Odin app on the computer and upload your rooting exploit from the desktop. Do not many any changes to the default settings from the Odin user-interface. Click the Start button and wait until you see the text on your Samsung Galaxy Core Prime’s display stating that it is going to reboot in 10 seconds. Everyone’s Samsung Galaxy Core Prime smartphone will now reboot automatically to recovery mode and then your device is officially rooted with the SuperSU installed and enabled. Any Core Prime that fails to boot to recovery will not be rooted until you get it in recovery. You should do that via the hardware buttons on your Core Prime by pressing the Volume Up + Home + Power keys during a reboot. The device must start from the off position.